Prepare for a sight for sore eyes: The hotly anticipated collaboration between Suno and Warby Parker is finally available online and in stores. By merging Max Osterweis and Erin Beatty’s colorful, nonconformist prints with Warby Parker’s geek-chic frames, the two brands have created a collection fueled by their shared passions for design and social change. The limited edition features three classic silhouettes—an aviator, a cat’s eye, and a circle—in three geometric and floral “textile” designs inspired by travels to Kenya, India, and Peru. True to the companies’ shared ethos, the partnership has a philanthropic component. For every pair of sunglasses you buy, Warby Parker will donate a pair of eyeglasses to someone in need. Prepare for a sight for sore eyes: The hotly anticipated collaboration between Suno and Warby Parker is finally available online and in stores. By merging Max Osterweis and Erin Beatty's colorful, nonconformist prints with Warby Parker's geek-chic frames, the two brands have created a collection fueled by their shared passions for design and social change. 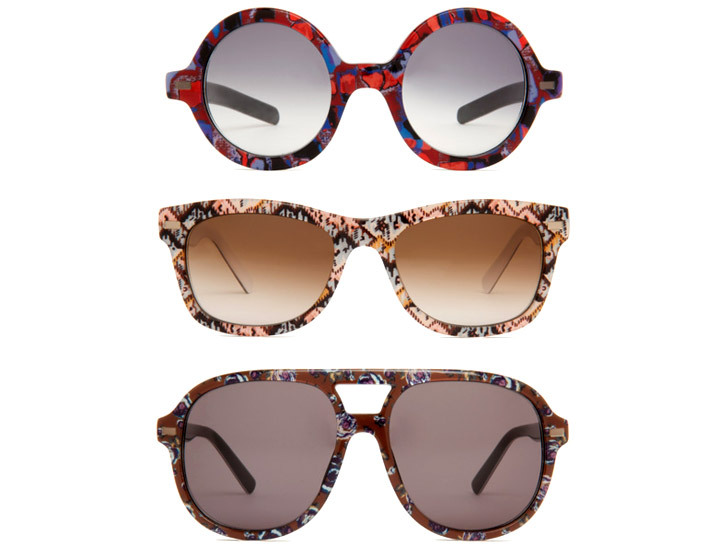 The limited edition features three classic silhouettes�an aviator, a cat's eye, and a circle�in three geometric and floral "textile" designs inspired by travels to Kenya, India, and Peru. True to the companies' shared ethos, the partnership has a philanthropic component. For every pair of sunglasses you buy, Warby Parker will donate a pair of eyeglasses to someone in need.